Previously released on Steam and PC, developed by Appnormals Team, and now debuting on consoles thanks to Ratalaika Games to assist with the porting, STAY is a mix of adventure and puzzle-based gameplay which sets you behind the screen during a tense abduction of the main character Quinn as you unravel the mystery and help him escape the house he finds himself in. You start off the game meeting Quinn, alone, scared, and visibly shaken as he comes to terms with his apparent abduction in a house, that as you progress through the game is a bit of a maze-like prison reminiscent of a horror movie. On the surface, STAY is an interactive story, where you spend most of your time playing through the 24 chapters directing Quinn’s next step, encouraging or discouraging him, and staying by his side throughout the ordeal. Each chapter contains a bit of dialogue both serious in tone, as well as a sarcastic, as Quinn realizes the emotional hell of being trapped inside the house unravels. During those conversations, you will have opportunities to suggest Quinn do something, like search a room for clues, solve a puzzle, or create a bond of trust with each other. The game employs these various gameplay mechanics to draw you in. The banter back and forth serves as the main bit of gameplay and for some people, the idea of a text-based game can be a bit bland. What STAY does well in is giving you a chance to interact with Quinn, making selections that either help you to get to know him or selections of dialogue that drive him away or off-topic. At the end of each chapter, you see a percentage of what others playing the game has done, which is an interesting bit that shows the gamer if they are more compassionate towards Quinn or maybe a bit hasty in moving the game forward. The puzzle elements of the game usually come once or so per chapter, where there is a mind-challenge that you must help Quinn through. Most of the puzzles are the standard ones you see in puzzle games, but a few of them are real mind teasers and require a bit of out of the box thinking. For those puzzles you may find yourself wishing the solution was spelled out for you, though, once you realize the solution you will feel pretty smart, or dumb if the solution was right in front of you the whole time. There were only two or three puzzles that I had to look at really long to see the solution for, but once I solved them, I did feel as though the developers needed to be given some credit as the brain teasers were really well done. STAY has a unique game mechanic that you will only really see if you pause or turn off the game. This game mechanic is basically the notion that every minute you are away from Quinn in the game, is a real-time minute in the real world. So if you start playing the game and take a break for an hour, Quinn will wonder where you went and if you even cared about him. This helps to impact your emotional connection in the game and oftentimes resulted in conversations about whether or not you even wanted him to get out of the house. The longer you stay away, the more intense those bonds are broken, and the more vicious Quinn’s responses can be once you do return to the game. In some ways, the real-time aspect of the game is a hook to keep you glued to seeing Quinn’s adventure and freedom from the house of horrors come to a conclusion. Sometimes just taking a short break seems to result in some unbalancing of your friendship, which for some could just leave you not caring or completing the game entirely. STAY is comprised of 24 chapters, which for the most part are segments of different areas of the house. The set up for each chapter is usually a bit of worry on Quinn’s part, of whether or not he’s in the right part of the house or should keep going; you reassuring him of your presence along with some confidence boosters, finding a clue, and then solving a puzzle. This tried and true mechanic did seem a bit tiresome towards the middle and end of the game, but the conversations and chapters were usually pretty short that three main gameplay styles did enough to keep me wanting more. During those 24 chapters, you will often find yourself immersed in the game and hoping that the next room will be the solution Quinn needs to get out of the house, only to find yourself deeper in the house and more isolated from getting out than you were before. Each room presents itself creepier than the last and without options, but after you goad Quinn to look around you soon find yourself with another puzzle that unlocks a hidden room, a key, or a way out to the next spot. Your window into Quinn’s life is done through a computer screen. You see and interact with Quinn selection options on the screen and notice how he responds, either by green or red prompts that show his trust and bond with you or his wavering unsettled emotions. The game builds up the intensity and isolation feelings through music that is both ominous and foreboding oftentimes the music would have me on the literal edge of my seat. The game doesn’t have much in terms of audio. There’s computer sounds like keyboard clicks and some environmental cues throughout, but for the most part, the audio is subtle, if not absent, which helps in general, to give the sense of despair and loneliness Quinn often expresses to you. There was one section of puzzles that had a peacock in it, which got somewhat annoying, as far as audio goes. The squawk of the peacock was loud and since most of the game is very quiet and subdued, felt somewhat out of place. If you want a game to give you a sense of panic, STAY has that in spades. 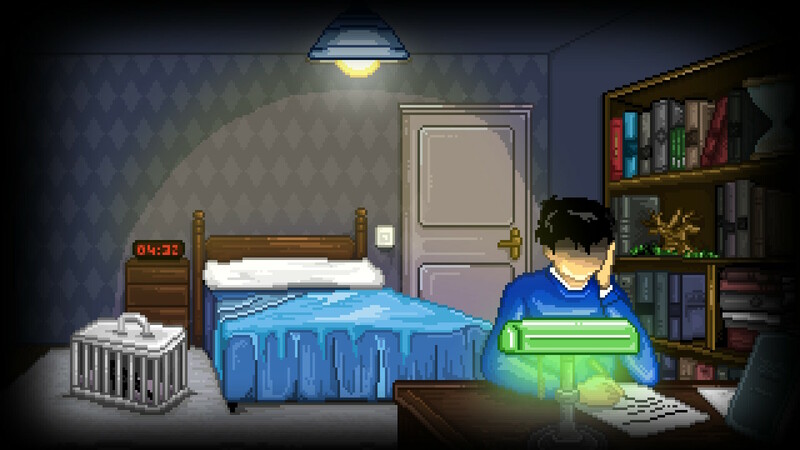 The game is simple, it’s a 2D pixel art game where most of the game is portrayed with you peering through a computer screen. The story unfolds in short chapters and contains a unique gameplay hook of being present with the character through their journey and a friendship that builds as you show compassion and understanding throughout the various prompts you choose. Getting to know Quinn and in a way suffering alongside his unsettling feelings as he expressed them to you is a gameplay element that really hooked me in. I found myself getting in the game learning more about Quinn and desiring to solve the mystery of him being stuck on the house. STAY plays smoothly both in docked and portable mode. I would advise that if you want to play the game and feel truly immersed in the world, headphones or a decent sound system, is a requirement. As you unravel the story its mood is set with the ambiance of music and subtly of its audio components. I don’t know the last time I ever felt real danger for a game’s protagonist. Usually, in a game, you are controlling the main hero and actually moving them along room to room fighting bad guys. With STAY there really isn’t a true bad guy, and you don’t really control Quinn. You can suggest that he look in a room for clues, and you can choose to show compassion or haste, but those choices you make play out very differently each time. STAY is all about immersing yourself as you help someone else. Someone that may be depressed on what seems like the worst day of their life, after being abducted and left in a house with seemingly no way out. If any of that sounds appealing to you, you will enjoy your “STAY”.